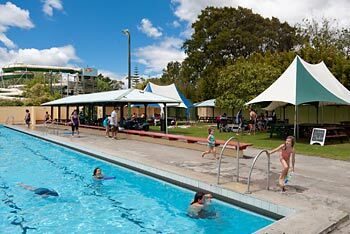 Two huge pools filled with natural hot thermal spring water combined with two exciting hydroslides make Parakai Springs an ideal family outing. The giant outdoor pool has a large shallow area for the smaller kids and is maintained at 34°C, while the all-weather indoor mineral pool is a toasty, stress-relieving 40°C. Qualified life guards supervise all water activities. For those that want to really unwind away from the crowds there are private spa pools available. There's also a cafe and video arcade adjoining the main inside pool, and barbeque/picnic areas for guest use. Ideal for company functions and picnics, staff training, conferences, wedding receptions - in fact any event with groups ranging from 30 to 200 people - Parakai Springs' private venue is the place for your next function. With its own hot mineral pool set amongst rocks and ferns in a beautifully landscaped garden, there is an indoor pavilion, large outdoor covered areas, private changing facilities and a grassed area bid enough for the largest marquee. Fully staffed with hostess and cook, there are a range of menu options ranging from finger food through to full smorgasbord. 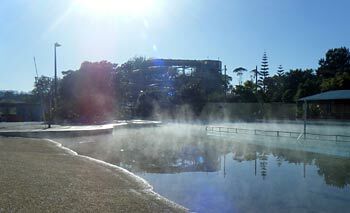 Entry includes free access to the rest of Parakai Springs' facilities. Parakai Springs' camping ground is set in beautiful park-like grounds among numerous mature trees. There are both caravan and tent sites and excellent kitchen, laundry and ablution facilities. Even family pets are welcome by prior arrangement. Camping can be on a site-only basis or combined with pools access.